The publication’s authors approached leading Czech and Slovak comics artists, selected 13 noteworthy recorded recollections from the archive of the Memory of Nations internet project and created something unique not just on the Czech comics scene but in the field of popularising our history. The fourth edition of the English-language review delivers a selection of the most noteworthy articles in the magazine Paměť a dějiny (Memory and History) from the preceding two years. It also includes an interview with the author of Zmizelá věda (Disappeared Science), a book recording the fates of scientists and intellectuals of Jewish origin in the years 1939–1945, a piece on late 1980s happenings against totalitarianism organised by the Society for a Merrier Present and much more. The third edition of the English-language review delivers a selection of the best articles in the magazine Paměť a dějiny (Memory and History). The publication, primarily intended for international readers, includes for instance pieces about the Czechoslovak broadcasts of the BBC during WWII, the Voice of America, the Czechoslovak State Security’s operations in Cuba and the Nazi “euthanasia” programme. This edition of the English-language review delivers a selection of the best articles in the magazine Paměť a dějiny (Memory and History). It contains expert studies, interviews, portraits and extensive photographic materials from our recent past. 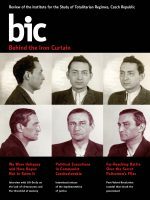 The publication, primarily intended for international readers, includes for instance pieces on the preparations for the assassination of Reinhard Heydrich, Allen Ginsberg’s visit to Prague, the secret police’s surveillance of Václav Havel, an interview with the well-known dissident Zdena Tominová and much more. This English-language publication introduces the work of the Institute for the Study of Totalitarian Regimes and the Security Services Archive. Alongside pieces on the Institute’s activities, it contains short studies from the magazine Paměť a dějiny (Memory and History). 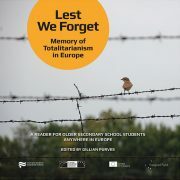 This reader primarily aimed at students delivers the stories of 30 people from 16 European countries whose lives were impacted by totalitarian regimes. Each portrait contains numerous photographs and documents while the book is also supplemented by a DVD of accompanying material (films, e-book, etc.). The Czech-English publication, published jointly by the Institute for the Study of Totalitarian Regimes of the Czech Republic and Poland’s Institute of National Remembrance, offers all basic materials available about Ryszard Siwiec, a 59-year-old Polish citizen, who committed self-immolation in a Warsaw stadium on September 8, 1968 in protest against the August Occupation of Czechoslovakia by armies of Warsaw Pact countries and the participation of the troops of the Polish People’s Republic in the invasion. English version of the collection contains more than 40 papers from participants at the international conference (Prague, 24 – 26 February 2010). This entirely bi-lingual Czech-English book brings forward one of a kind, never before published photographs taken in the course of secret police surveillance during the period of the Communist dictatorship in Czechoslovakia.